Hello Michele Made Me friends! I'm so excited to be one of Michele's guests. 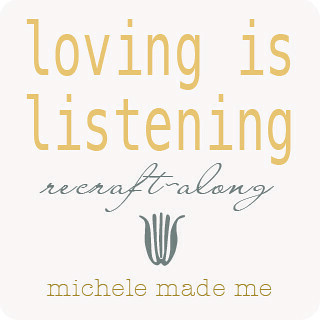 I love Michele's blog... Her projects and her perspective are so inspiring and honest. I am just thrilled to be here. I'm sharing how to make what I call the Super Scrappy Scarf but 'scarf' really doesn't scratch the surface of what this scrappy chain of knit fabrics can be. 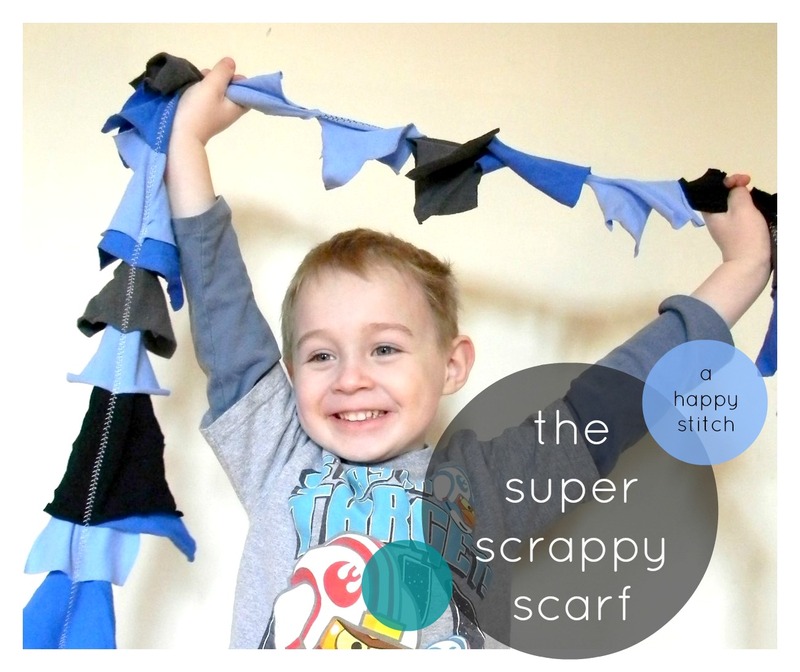 Intended to spark the imagination, the Super Scrappy Scarf is a great open-ended play-thing for little people and in our home it has been everything from pretend hair, a tail, 'water', a finish line and on and on... It's super! So, let's get cracking on how to make it! 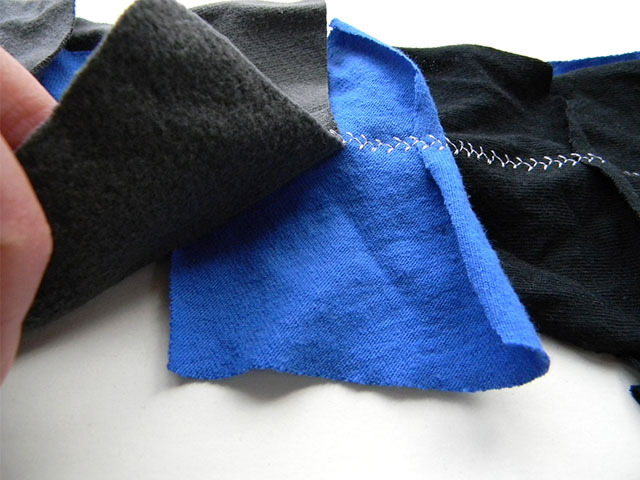 Because the Super Scrappy scarf involves sewing with knits, it offers a great chance to practice sewing with knit fabrics without any pressure of getting it 'right'. But, it does involve a few specific supplies that make the whole process much easier. Scraps of knit fabric sized around 5" to 7" squares and rectangles. To make mine I cut up some of the many, many old t-shirts we seem to always have around. I wasn't very specific about size, just cut the shirts into similarly-sized not-too-big scraps. Jersey (or stretch) sewing machine needles (these are really, really helpful to sewing with knits and relatively inexpensive..I don't recommend trying to sew knits without the correct needle). 100% polyester thread, I happen to have 'maxi-lock' thread, which has a bit extra stretch to it but any 100% polyester thread works great. 2. 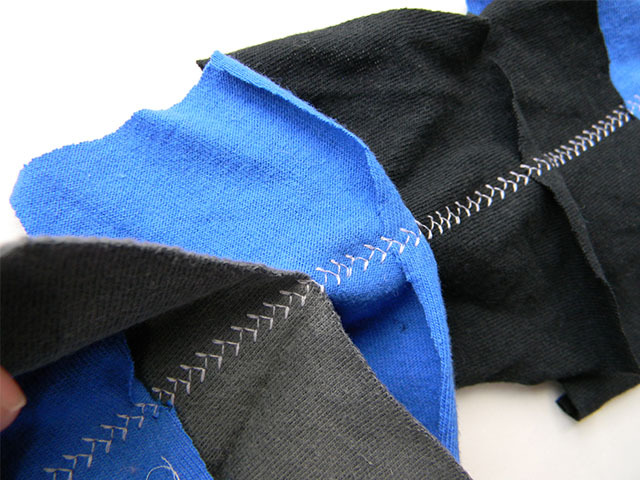 Set up your machine: Put in the jersey needle; thread the bobbin and the machine with the polyester thread; put on the Teflon (or walking foot) sewing foot and set your sewing machine to a stretch stitch or zigzag stitch. 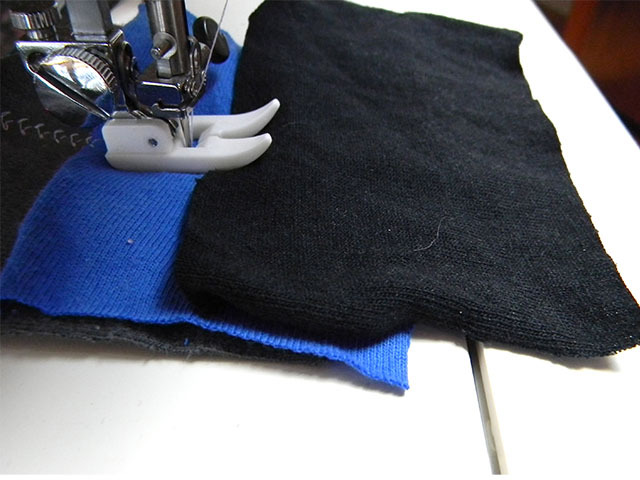 The picture below shows what a stretch stitch looks like, on my machine. The stretch stitch works beautifully but a good zigzag stitch is also great... Just be sure to avoid sewing with a straight stitch because as soon as the scarf is tugged, the stitches will break. 3. The rest is simple! Start sewing and as you get about halfway along one fabric scrap grab the next one in a different color, lay it down and sew over it. 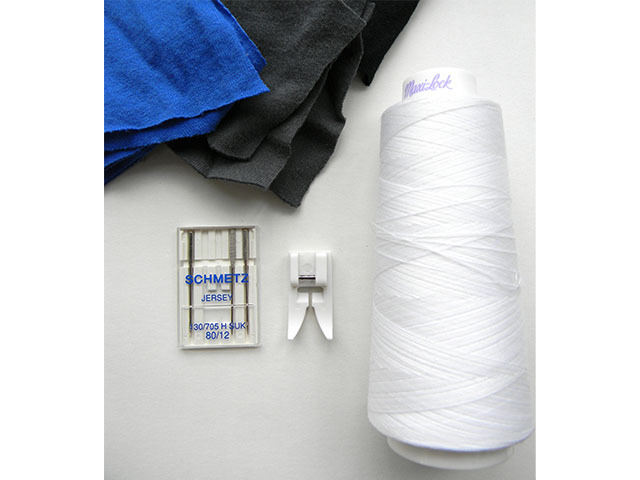 Once you get going, you won't even need to stop sewing while you grab the next scrap! 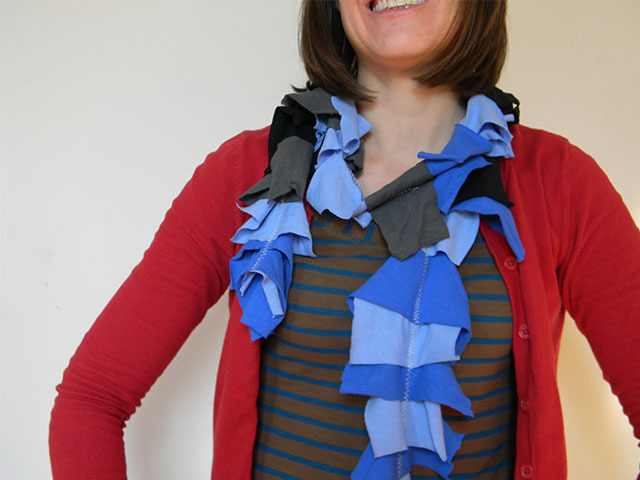 Keep on grabbing scraps and sewing until you have made the scrappy scarf as long as you want it or until you use up your scraps! So easy! The best part is you don't have to worry about fraying edges with the knit fabric, so you can even make one super long scarf and cut it in half to make two scarves in one go! This is especially handy if you have two boys, like I do, who always need to have an exact replica of what the other is playing with. Heck, you might even like the scarf enough to wear it yourself! What can I say, it's super scrappy! 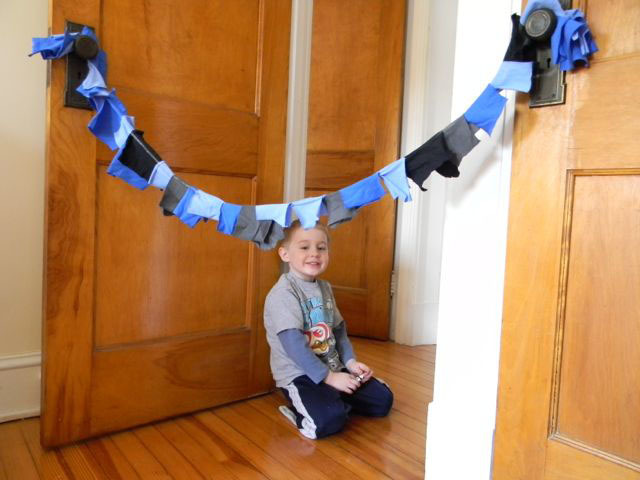 Thank you for sharing your totally multi-FUNctional Super Scrappy Scarf with us today, Melissa Q. Whipping one of these babies up promises to put smiles on little faces, doesn't it? What a simple yet versatile toy! Go on now... "Happy" exploring to you! P.S. 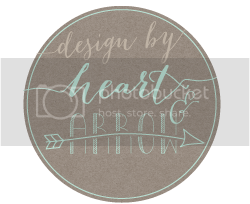 Have an idea for a lovely eco-type craft? Seeking to widen your audience? 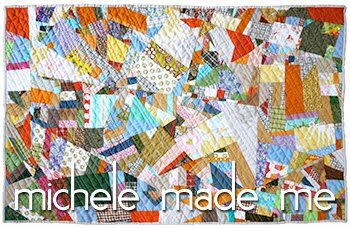 Consider submitting a guest-post idea to Michele Made Me's "You Guest It"! Find out how right HERE. What a fun and simple sewing project. Even I---who is an amateur at sewing---believes I could make this and have a lot of fun with it. I like that it could be used as bunting or as a scarf! Thank you Melissa Q!!!!! What a great project! And thanks so much Michele for introducing us to Melissa - I just hopped over to her blog and spent ages browsing! Brilliant!